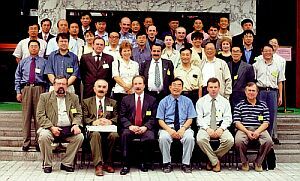 During the 5th International Symposium on Self-Propagating High-Temperature Synthesis (SHS'99) held in Moscow on August 16-19, 1999, Academician A.G.MERZHANOV and Prof. Chang-Chun GE found it urgent to organize the First Sino-Russian Workshop on SHS in China. 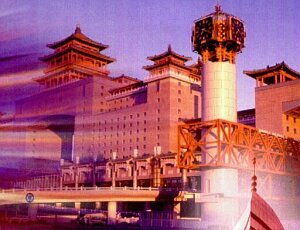 Owing to bilateral efforts, this Workshop was held in Beijing at the XIJIAO HOTEL BEIJING, located at the Zhongguanchun Science & Technology Park. The Workshop was sponsored by the Institute of Structural Macrokinetics and Materials Science, Russian Academy of Science (ISMAN), and the University of Science and Technology Beijing (USTB). The event was also financially supported by the National Natural Sciences Foundation of China, China High-Tech New Materials Committee, and the Russian Foundation for Basic Research. This was the premier Sino-Russian forum for SHS research that provided an unparalleled opportunity to present recent advance in the field, to participate in exchange by ideas, and to stimulate SHS research in China and Russia at the beginning of new century. At the Opening Ceremony, the participants were greeted by Prof. Li-Kai SHI (National Advanced Materials Committee of China), Prof. Jin-Wu XU (Vice-President, USTB), Prof. Chang-Chun GE (USTB), Prof. A.S.ROGACHEV (ISMAN), Dr. A.E.SYTSCHEV (ISMAN), Prof. Yi WANG (Director, Metallurgical Science & Technology Development Center, State Administration of Metallurgical Industry). Four lectures were delivered at the first session (Chairmen: Prof. C.Ge and Prof. A.S.Rogachev). Prof. A.S.Rogachev (A.Rogachev, S.Kirillov, I.Kotin. On the Main Stages of Structure Formation in SHS) analyzed the major stages of structure formation in SHS products and some experimental techniques that are being used in the field. It can be concluded from the experimental data that the grain growth behind the combustion front stops when (1) the interlayer melt is completely consumed (grain-grain) boundaries form); (2) a growing grain meets a pore surface; (3) the melt crystallizes upon sample cooling. If at least one of these events takes place, the further growth of refractory grains sharply decelerates or stops. Prof. C.Ge (C.C.Ge, J.T.Li. Development of SHS Nitride-Based Composite in LSCPM) talked about the achievements in synthesis of nitride-based composites. Three kinds of SHS nitride-based composites with examples were being developed in LSCPM, USTB of China. The state-of-art in the thermodynamics of SHS processes was analyzed by Dr. S.S.Mamyan (S.Mamyan. Thermodynamic Analysis of SHS Processes) and Dr. S. Yin (S.Yin, Y.H.Liu and H.Y.Lai. Thermodynamic Analysis of Combustion Synthesis of Aluminum/Boride Composite). The problem of thermodynamic potential of the system and energy conservation equation by a preset ratio of initial components, pressure or volume of gas phase, and initial temperature are analyzed. At the second session (Chairmen: Dr. S.S.Mamyan and Prof. S. Yin), much interest was displayed in the lecture by Prof. S. Zhang (S.G.Zhang, X.X.Zhou, D.H.Qian. Properties of Ceramic-lined Composite Steel Pipes and Their Application) on the production and application of ceramic-lined composite steel pipes. New technological improvements were utilized to produce ceramic-coated steel pipes of different configuration for use in mining power plants, metallurgy, coal mines, petroleum production, and in production of building materials. It was demonstrated that long and curved pipes could be readily coated by SHS even without centrifugal machines. Prof. T.P.Ivleva (T.Ivleva, A.Merzhanov. Mathematical 3d-Modeling for Spinning Gasless Combustion Waves) presented basic results on the propagation mechanism for 3D spinning waves in the range of unstable combustion. The lecture was illustrated by impressive multimedia presentation. Dr. Y.Q.Li (Y.J.Wu, X.M.Zhang, Y.Q.Li, W.H.Yin, L.Zhou, Z.H.Jin. TiNi and Other Intermetallic Compounds Prepared by SHS Process and the Application) reported on SHS of intermetallic composites (Al-V alloy, Ti-Ni shape memory alloys, TiAl intermetallic compound, Zr-Ni alloy powder, etc.) of different configuration (wire, rings, platelets, tubes, etc.). Dr. A.E.Sytschev (A.Merzhanov, A.Rogachev, A.Sytschev, H.Grigoryan, C.C.Ge, W.B.Cao, W.P.Shen. Combustion and Structure Formation of FGM by SHS) talked about SHS in microgravity aboard the Mir space station. Microgravity was found to affect the macro- and microscopic structure of SHS products. Prof. C.C.Ge (C.C.Ge, F.R.Hu. Self-propagating Low-temperature Synthesis of BaTiO3 Powder) reported on the possibility of preparing finely dispersed BaTiO3 powders (200-350 mm). The phase formation and parameters of the powder were found to depend on the 'NO3-/citric acid' molar ratio. The joint Sino-Russian work, presented by Prof. A.S.Rogachev on behalf of the working group (A.Merzhanov, A.Rogachev, A.Sytschev, H.Grigoryan, C.C.Ge, W.B.Cao, W.P.Shen. Combustion and Structure Formation of FGM by SHS) was devoted to the combustion modes taking place during SHS reactions in two- and three-layer samples and formation of graded composition and structure of reaction products. These data are of current importance for design of new functionally graded materials. Dr. Z.D.Zou (Z.G.Zou, Z.Y.Fu, R.Z.Yuan. Nonlinear Characteristics of Combustion Wave in SHS) theoretically analyzed the nonlinearity of combustion wave during SHS. The SHS process was found to exhibit two types of nonlinearity: (1) by temperature and burning velocity and (2) by heat losses and burning velocity. A very interesting work on the luminescence of corundum-containing Ti composites was presented by Prof. T.D.Xia (T.D.Xia. Luminescence of the Corundum-containing Ti Compounds Composites by Self-propagating High-temperature Synthesis). Upon laser or electron excitation, SHS-produced Al2O3-TiC and Al2O3-TiB2 composites were found to emit in the visible. At the third session (Chairmen: Dr. S.Kirylau and Prof. Z.Fu), Prof. S.J.Li (S.J.Li, X.B.Liang, H.P.Duan, Y.Zhang, Z.J.Dang. Joining of the SiC Ceramic to Ni-based Superalloy with Cu intermediate layer) reported on joining the SiC ceramic with a Ni-based superalloy (with an intermediate layer of copper in between). The mechanism of interdiffusion at the interface was analyzed in detail. The effect of process parameters (temperature, holding time, applied pressure, and Cu layer thickness) on the strength of joining was investigated. Prof. S.Kharatyan (S.Kharatyan, H.Nersisyan. Chemically Activated SHS in Synthesis of Refractory Carbide Powders) spoke about chemically activated SHS of refractory carbide powders: activating ability of halogen-containing additives (for a model system), non-singularity of stationary combustion modes and reaction pathway activation of low-caloric systems, SHS activation with a reduction stage, and formation of crystal structure during activated SHS. Dr. H.Wang (H.Wang, Z.Y.Fu, W.M.Wang, Q.J.Zhang, R.Z.Yuan. Multiphase Ceramics and Ceramics Made in One Step Synthesis and Densification by SHS/QP) reported on preparation of multiphase ceramics and ceramics synthesized in a one-step process followed by SHS/QP densification. The effect of process parameters on the physical and mechanical properties of resultant products was explored. Dr. B.S.Seplyarskii (B.S.Seplyarskii. The Convective-Conductive Mode of the Reaction Zone Propagation: a New Mechanism of Combustion of "Gasless" Systems) presented a new mechanism of combustion in gasless systems involving the convective-conductive mode of wave propagation. At the initial stage, the burning velocity and gas pressure was found to grow exponentially, provided that a sample has room for its expansion. Prof. Z.M.Zhao made two presentations (M.Zhao, M.H.Ye, J.H.Wen, X.K.Du, X.G.Chen, J.J.Wang. Interface Phenomena in ceramic-Lined Coal-Dust Injection Gun Pipes Produced by GS-T SHS Process and J.J.Wang, J.H.Wen, Z.M.Zhao, X.G.Chen, X.K.Du, M.H.Ye. Design and Application of Automation Equipment for Producing SHS Curved Ceramic-lined Composite Pipes). The latter work illustrated the feasibility of automated production of curved ceramic-lined pipes. Dr. K.P.Smirnov (K.Smirnov, I.Borovinskaya. SHS and some properties of SIALON ceramics) talked about preparation and properties of SIALON ceramics. The factors that affect the density and composition of SIALON ceramics synthesized under the conditions of infiltration-assisted SHS (with regard to green composition and nitrogen gas pressure) have been specified. Prof. B.L. Zhang (B.L.Zhang, W.L.Li, S.Y.Xu, X.R.Xu, G.J.Jiang, H.R.Zhuang. Self-propagating High-temperature Synthesis of Nitrides - Progress of SHS in SICAS) considered the feasibility of cost-effective SHS production of high-quality nitride powders in laboratory and on an industrial scale. The suggested mechanism for SHS of Si3N4 was compared with that in conventional nitridation of silicon. The fourth session (Chairmen: Prof. S.Kharatyan and Prof. X.Xe) opened with the presentation by Dr. I.Kotin (I.Kotin. The Effect of Electric Diffusion and Heat Losses on the SHS Wave) entitled as The Effect of Electric Diffusion and Heat Losses on the SHS Wave. The burning velocity was found to increase with an increase in Joule heating. An increase in the rate of electrodiffusion also leads to in increase in the burning velocity. Prof. Q.Tang (Q.Tang, Q.Dong, W.C.Li and D.Y.Wu. Thermodynamic Analysis on Combustion Synthesis of Al2O3-TiC-ZrO2 Composites) reported on the thermodynamics for SHS of Al2O3-TiC-ZrO2 composites with special emphasis on the microstructure and phase composition of resultant product. Dr. S.Kirillov (A.Lesnikovich, S.Kirillov. Self-organization of the Liquid Flame Front) talked about self-organization in the front of liquid flame. It was assumed that L-sphere (a liquid spherical envelope consisting of liquid phase reagents, liquid phase bubbles, and a bubble liquid) is fractal cluster naturally close to ball lighting. Dr. J.T.Li (J.T.Li, C.C.Ge. Structural Formation and Mechanism in Combustion Synthesis of Nitride Ceramics) made a presentation devoted to structure formation and mechanism of combustion during SHS of nitride ceramics (AlN, Si3N4, AlN-SiC). For the systems under study, the vapor-crystal mechanism is dominating when the particle size is below 20 mm. Dr. A.V.Karpov (A.Karpov, I.Borovinskaya, Yu.Morozov, V.Bunin, Electrophysical properties of SHS ceramics) reported on the effect of added Y2O3 on the electric properties of SHS-produced ceramics. An abnormal behavior of the resistance at high temperatures is associated with the metastable character of percolation processes in the crystal structure of multicomponent conducting ceramics. Dr. Z.K.Zhu (B.C.Cheng, X.K.Zhu, K.Y.Zhao, Q.S.Lin, X.Q.Zhang. Reactive Fabrication of Nanocrystalline Titanium Carbides by Mechanical Alloying) reported on reactive fabrication of nanocrystalline carbides by mechanical alloying. This technique was found suitable for production of nanophase TiC. Dr. V.A.Shcherbakov (SHS Welding of Hard Alloy and Steel) reported formation of permanent joints of the WC-8Co hard alloy and Steel 45 using the SHS welding method. The effect of mixture layer on the weld strength has been studied. The fifth session (Chairmen: Dr. A.E.Sytschev and Prof. S.J.Li) got started with the presentation by Prof. X.H.Zhang (X.D.He, J.C.Han, X.H.Zhang, S.Y.Du, Kinetic Parameters of the Thermal Explosion Reaction of Ni-Al-Fe System) on the kinetic parameters of the thermal-explosion reaction in the Ni-Al-Fe system. Thermal explosion was found to proceed in the solid and liquid phase. The activation energy for thermal explosion increases in the presence of added iron. Dr. T.V.Barinova (T.Barinova, I.Borovinskaya, V.Ratnikov, T.Ignatjeva, V.Zakorzhevsky. SHS Immobilization of Radioactive Wastes) talked about immobilization of radionuclides by SHS. For perovskite-like ceramics and model radionuclides taken as an example, Cs escape was found to decrease during synthesis while the content of Al, Si, and Ti oxides, to increase. The Cs distribution over the sample volume was found to be uniform. Prof. J.T.Guo (T.Lin, S.J.Guo, S.Yin, Z.M.Guo. Combustion Characteristics of Al-Fe2O3 System in The Thermite-Gravitation Synthesis) reported on preparation of different NiAl-based composites by HPES. The NiAl-(Al2O3 + TiC) were found to exhibit even better mechanical properties at high temperatures than, for example, double NiAl. In case of NiAl-(Al2O3+TiC), the adiabatic temperature increases with growing initiation temperature and upon doping. In his presentation 'Commercialization of SHS Products in China', Dr. Yu.N.Barinov (Yu.Barinov. Commercialization of SHS products in China) outlined the state-of-art in transferring various SHS processes (including equipment) from ISMAN to various Chinese manufacturers. Prof. T.Lin (T.Lin, S.J.Guo, S.Yin, Z.M.Guo. Combustion Characteristics of Al-Fe2O3 System in the Thermite-Gravitation Synthesis) spoke on the 'Combustion Characteristics of Al-Fe2O3 System in the Thermal-Gravitation Synthesis'. It was demonstrated that the ceramic-lined pipes could be prepared without conventional centrifugal processes. Dr. A.Yu.Gordopolov made two presentations(A.Yu.Gordopolov, S.G.Vadchenko and A.S.Mukas'yan. The Role of Molecular (Gas-Phase) and Conduction Heat Transfer in Propagation of Combustion, A.Yu.Gordopolov, Yu.A.Gordopolov, V.M.Fedorov and R.M.Shikhverdiev. Shock-induced Chemical Reaction in Ti-C Blends): 'The Role Molecular (Gas-Phase) and Conduction Heat Transfer in Propagation of Combustion Wave' and 'Shock-Induced Chemical Reaction in Ti-C Blends'. The latter report presents experimental evidence for occurrence of chemical reaction (at least, partial) in the shock wave, that is, in the mode of shock-wave synthesis. In the last presentation Prof. X.H. Zhang (G.Q.Chen, J.C.Han, X.H.Zhang. Synthesis of Si3N4-TiN-SiC Composites by Combustion Reaction Under High Nitrogen Pressure) reported on nitridation of TiSi2 at high nitrogen pressure. This reaction may be expected to proceed in two stages: TiSi2 + N2 = TiN + Si and Si + N2 = Si3N4. At the closing ceremony, Prof. C.C.Ge and Prof. A.S.Rogachev outlined a high level of the Workshop that became possible owing to financial support from the National Natural Sciences Foundation of China, from USTB, and general activity of the participants. The Workshop demonstrated an elevated level of the R & D carried out in the field of SHS in China. Fruitful exchange by opinions between the participants may turn out helpful for finding new ways for further cooperation. The Workshop Proceedings have been published as a separate issue. It is also planned to publish the selected papers in a special issue of Izv. Vyssh. Uchebn. Zaved., Zvetn. Metall.